Lenan Norris was a volunteer from British Columbia. He immigrated from England to Canada in 1920. He was affiliated with the Young Communist League, the Communist Part of Canada, the Canadian Labour Defence League, and the Relief Project Workers' Union. Before travelling to Spain, he served with a Canadian Militia. Claude "Clive" Nash was born in 1918 in Camrose, Alberta. A logger and farmer, Nash was a stretcher bearer and rifleman with the Mac-Paps in Spain. He served with the Canadian Army in WWII and died in 1998. 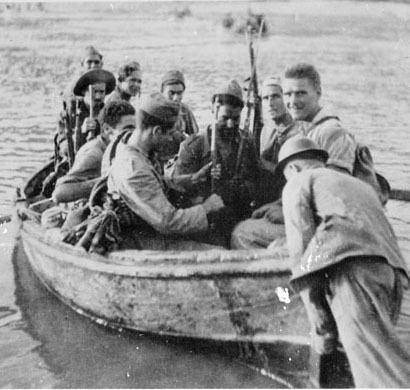 Nash served in the Ebro Offensive and during the Retreats, and was WIA in the leg at Gandesa in April 1938, recovering for a month at Mataro. The volunteer of the week is William Brennan of Toronto. Born in 1917, he served on the National Bureau of the Communist Party from 1933, and worked as a plasterer. His account of the Battle of Brunete was included in the Book of the XV Brigade. While recovering from a wound, Brennan worked with the Historical Commission of the International Brigades in Albacete, the organization which collected much of the information we have about the volunteers. The volunteers of the week are Stanley Vernon and Mike Velichko, two Canadian volunteers who survived their time in Spain but died while participating in RCAF bombing raids in 1944 over Borsdorf, Germany. Pictured is Vernon, who served with the Lincolns. We don't have many details about Velichko's life. He lived in Winnipeg and worked as a miner in Canada. He was born around 1902 and was either Ukrainian or Hungarian. In Spain he was wounded, and returned to Canada in 1938. Bartflom Dmitruk, also known as Bart or Bert, was a Ukrainian Canadian volunteer. He immigrated to Canada in 1927. He was a lumber worker and lived in Manitoba and Northern Ontario. In Spain, he served in the 129th Anti-Aircraft/Anti-Tank Battery. He survived the war and was awarded the International Brigades Medal in January 1939. He returned to Canada a month later.